How do I use the Images Tab? When manually adding or editing product the second tab you will be presented with is the product's Images Tab. The Images Tab is where you will assign the various display images and options for your product. In this article we will demonstrate the various options available in this tab. This method (not available on demo accounts) is accessible by connecting to your store through an FTP client or program. For more information on FTP, please view our article here. In summary, FTP is a way to transfer files from one computer (your home computer) to another (the store's server), through the use of the File Transfer Protocol (FTP). When uploading product images to your site be sure to upload them to your "web/assets/images" folder. 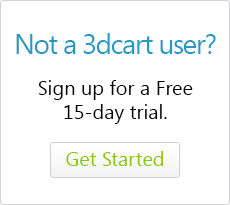 This method (available on all accounts) is located in your 3dcart Online Store Manager. Using this feature to upload your images will automatically place them in the "web/assets/images" folder mentioned above and is a more graphical method of uploading your images. In your store's settings you can set the default sizing for the Thumbnail, Product and Large image sizes for your store When uploading images to your site, the images will not be re-sized until they are assigned to products by the store to fit within the parameters specified in these fields. This means that if you upload an image with a resolution larger than the sizes depicted in these settings then the image will be shrunk to fit within those specifications. The resizing itself will not alter the proportions of your images, but rather reset the resolution to be within the limits of the settings. So if your settings are 450 pixels by 450 pixels, and your uploaded image's resolution is 640 pixels by 480 pixels, the system will re-size the image (if it is larger) so that its proportions are within the 450 pixel range (450 by 338 in this case). Again, the image's proportions won't change but the resolution will be re-sized to match your settings, and the resizing will only occur if the image is larger than your settings specify. Also of note: these settings apply only to images assigned to products via the Online Store Manager. Images assigned via CSV import will not incur any resizing. First, we will specify our main image. To do this, go to your product's Images Tab and look towards the "Drop files to upload" section. This section is made up of three disctinct areas that allow you to drop images directly into the store, browse images that you have already uploaded, or otherwise specify a file path/URL to the images if they are hosted separately. After uploading or selecting the image, you can also specify a caption that will display along with the image. Along with the Main Image, you can also use the same steps to set up the product's Thumbnail Image. In fact, after assigning an image to the product, you can hover over the image and click on the "Create Thumbnail" link to have a copy of the image created for use as a thumbnail. Your product's main image will appear when specifically viewing the product's actual listing in the store. The listing page will contain the main image, pricing and availability information as well as options selections if they apply. The product's thumbnail will appear when browsing your store's categories and other pages where the products are represented outside their main listing. Generally, thumbnails are simply smaller resolution versions of the main image. Aside from your main product image, you can also set additional images to be displayed on your product. These will be shown next to your product and will update when clicked individually. You can upload as many images for the product as needed to display even more variants of your product as needed.